This is another great recipe adapted from Heidi Swanson’s Super Natural Every Day. Swanson, whose blog 101 Cookbooks is an amazing source of ideas and inspiration, makes food that is healthy, wholesome, a little quirky, always delicious, and never preachy. The great thing about her vegetarian recipes is how amenable they are to your tastes. You can substitute chicken for tofu, or add shrimp, or beef, or pork, and the dishes will still be great. 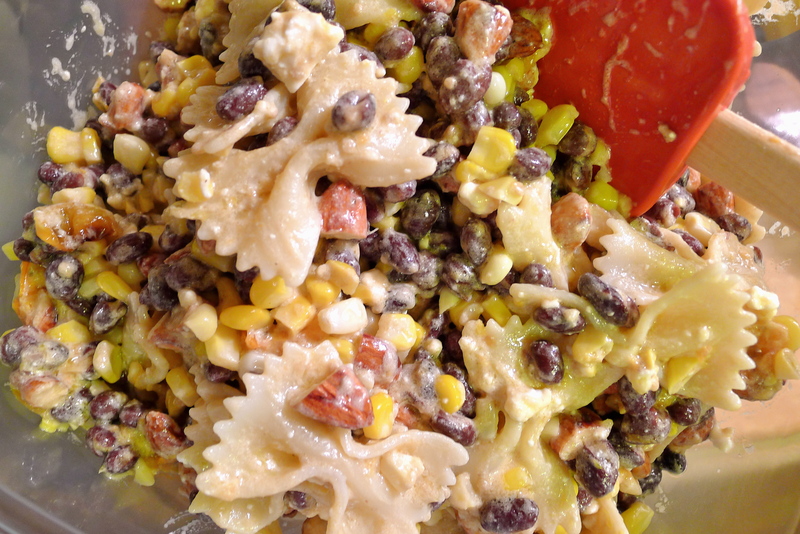 For this recipe, I added local corn and the farfalle. Since Hurricane Irene, our farmers need all the help we can give them. Though NYC was mostly spared, many of the farmers and growers who bring the literal fruits of their labor every week to us were not. Almost no farm was left untouched by the flooding. Support local and please make a donation here. 2. Line a rimmed baking sheet with parchment paper. Spread the tomato halves over the sheet and sprinkle them liberally with salt and sugar. Drizzle the halves with olive oil. Toss everything together so that the tomatoes are evenly coated in the oil, salt, and sugar. Arrange the tomatoes cut-side up. Roast them until they have shrunken, and have begun to caramelize around their edges, about 45 minutes. Remove them from the oven, and when they are cool, scrape them into a large bowl along with all their caramelized juices. 3. Meanwhile, heat the almonds in a single layer in a large cast-iron skillet set over medium heat. Toss them around every couple of minutes until they are fragrant and toasty. Be sure to monitor the nuts closely; they can burn in a minute! When the almond halves are toasted, add them to the same large bowl as the tomatoes. 4. Wipe out the skillet and add about 1 tablespoon of olive oil. Heat the pan over medium-high heat until the oil begins to shimmer. Add the corn, and toss the kernels in the hot oil until they begin to brown. Add the corn to the same large bowl as the almonds and tomatoes. 5. Add the remaining ingredients to the bowl and drizzle everything with olive oil. Toss everything together well. Adjust the seasoning and serve.